Over the summer, Dylan Simon joined the project as Research Data Storage Architect, bringing with him both post-doctoral neuroscience research and storage industry software development experience and having designed and built one data repository here at NYU already. He will drive new technology offerings and continue design of new features based on the architecture and functional guidance provided by researchers, librarians, and technology specialists throughout this year. One of Dylan’s first areas of emphasis is addressing the research activities we identified in Service Band 2, where there are currently the most unmet needs across the University. Through the DRSR project, NYU hopes to offer a new research file storage service that will provide a secure, network-based collaboration space for active research data, accessible directly from any application on OSX, Windows, or Linux. 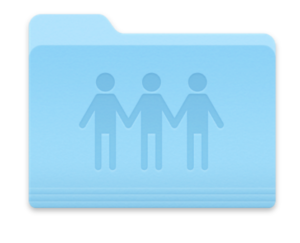 By consolidating many existing lab- and department-based file servers, hard disks, and other shared and personal storage, this new file storage service will reduce the risk, hassle, and cost of managing many types of research data. 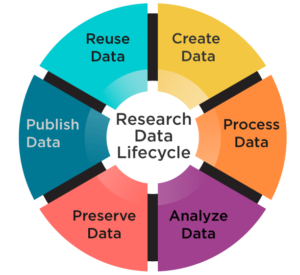 It will also serve as a complement to storage services offered in Service Band 3, such as the Faculty Digital Archive, the RSTAR preservation repository, and the Spatial Data Repository, that offer additional preservation and curation options. 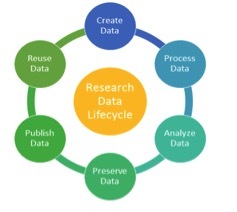 Future offerings will aim to make it easier to share, manage, and follow these data throughout the research data lifecycle. 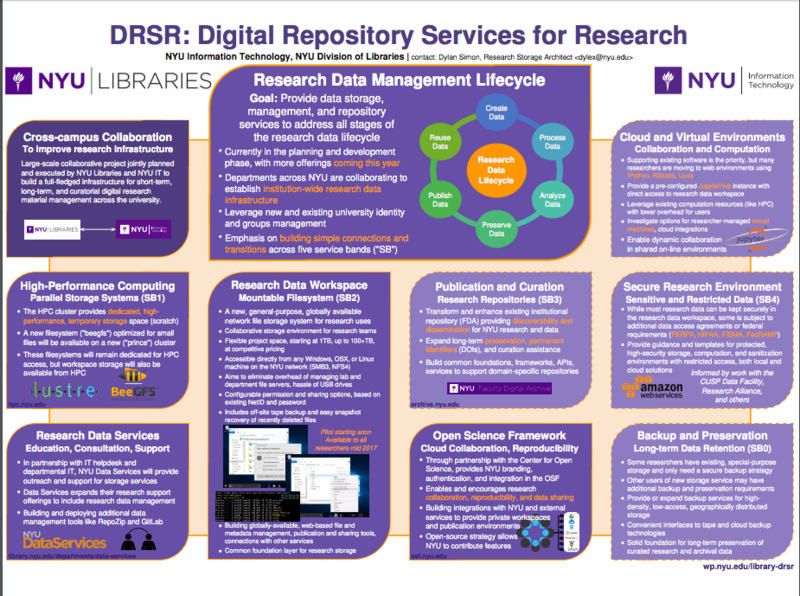 DRSR is a joint Libraries-IT project that is working to create central repository services that address the needs of NYU researchers and librarians with with respect to the research data lifecycle. The project has been underway for just over a year, and you may have heard updates about the project at several meetings in the spring or at a Digital Infrastructure Roadshow over the summer. We thought a fall update with an informal setting that allows lots of questions and answers might be a good idea! We’ll provide soft drinks and cookies to complement your brown bag lunch.